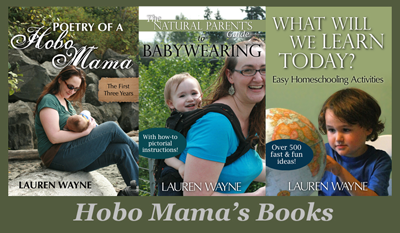 Hobo Mama: Yea for BabyLegs! I was at the Alki Avenue Car-Free Day festival, where the Seattle-based company BabyLegs had a booth set up as part of the Cones for Kids fundraiser for Children's Hospital. 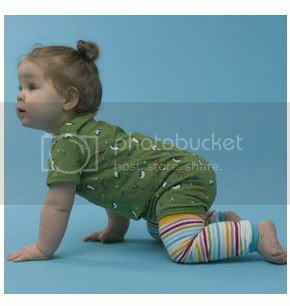 Instead of donating to that fine institution where my baby had his testicular surgery this summer, I went ahead and took advantage of BabyLegs' largesse and scored a sweet pair of stripey green leg warmers for my little chubster's limbs. As repayment, I hereto write this blog post extolling BabyLegs and admonishing everyone else to pay actual money. Ok, in the past, I have purchased BabyLegs, which is why I knew they were awesome. They're great for elimination communication, because your baby can go pants-less but keep warm, and in the same vein they're perfect for diaper changes because a t-shirt, wool diaper cover and BabyLegs make for a rockin' look. They're ideal for crawlers, because they protect knees but keep feet bare for traction. If you later go out and your little one's tootsies are getting chilly, just pull the BabyLegs down over the heel like the chicest ballerinas do. If you have pants but no sleeves, just transfer the warmers to the arms instead of using a bulky sweater for moderate days. Go forth and BabyLeg your baby!